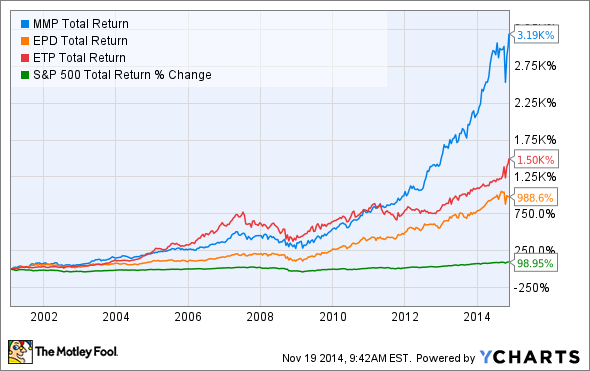 Magellan Midstream Partners has been one of the best income investments of the last 16 years. Learn why this amazing dividend stock needs to be on your radar. Magellan Midstream Partners (NYSE:MMP) has been one of the most successful income investments in the United States over the last 16 years. Fueled by fantastic distribution growth that has resulted in a total return of more than 3,000% while the S&P 500 has only returned 98% over that same time period. This article will highlight three key reasons why Magellan Midstream Partners' distribution growth is likely to continue for years to come. These reasons highlight competitive advantages this master limited partnership holds over high-yield peers in the pipeline space such as Enterprise Products Partners (NYSE:EPD), Energy Transfer Partners (NYSE:ETP), and Kinder Morgan (NYSE:KMI). There are two key things to understand about this table. First is the importance of cost of capital in the midstream MLP industry, and the second is that Magellan's weighted average cost of capital, or WACC, is much lower than it looks. Cost of capital simply represents the cost of raising funds to grow. Since MLPs pay out the vast majority of their earnings to investors as distributions, growth usually requires taking on debt or selling additional units. Distribution growth is thus reliant on an MLP keeping its WACC as low as possible and maximizing its returns on invested capital. Not only does a low WACC mean higher profitability, but it also increases the pool of potential projects that a partnership can undertake, thus possibly growing the potential backlog and perhaps fueling years of strong distribution growth. Why would I say that Magellan Midstream has an advantage over its peers when the above table shows its WACC as the highest of the four? Because that cost of capital figure assumes 86% of Magellan's funds will come from equity issuances. However, Magellan hasn't sold new equity to fund projects since 2010 due to its ability to fund growth organically with only moderate debt leverage.Thus, its effective cost of capital is closer to its debt cost of 3.4%, far lower than many of its peers. Another competitive advantage is that Magellan bought out its general partner in 2009, at the height of the financial crisis, for a very attractive price, thus eliminating its incentive distribution rights, or IDRs. Since IDRs can result in 50% of marginal cash flow being paid to the general partner, this acquisition allowed Magellan to keep more of its cash to grow the partnership and distribution, faster, without resorting to equity or debt issuances. Sources: Morningstar.com, Fastgraphs, Yahoo! Finance, 10-K, 10-Q, investor presentations, Bloomberg Intelligence. This table highlights several important facts about Magellan's debt structure. First, it has one of the highest credit ratings in its industry, which helps lowers its borrowing costs. Second, it has far less debt than its peers. In fact, on a debt-to-EBITDA basis, which compares debt loads relative to the size of a MLP's adjusted earnings and is a key variable for determining a MLP's credit rating, Magellan is 48% below the industry average. Thanks to this low debt level, Magellan's interest expenses poses very little threat to the distribution, as illustrated by the current ratio, (a measure of short-term liquidity) being 16% higher than the industry average. Finally, management has been aggressive in its long-term debt reduction plan, as illustrated by the below image. This is important because during the financial crisis of 2008-2009 Magellan was able to tap its credit facilities and continue investing in new projects. This, along with the well-timed buyout of its general partner, is why the MLP was able to grow its distribution by 18.5% annually between 2008 and 2010. Management's decision to once again reduce the partnership's leverage increases the MLP's financial flexibility and offers protection to distribution growth should another credit crunch occur. I want to make two key points about Magellan's management team. First, it has a proven track record of making brilliant decisions courtesy of conservative, long-term thinking. For example, executives had the foresight to keep Magellan's debt leverage low prior to the credit crisis (while still growing the distribution by 23% annually) and buy out its general partner in March 2009, literally at the bottom of the market crash, for the lowest possible price. In addition, in 2010 after the Macondo oil spill forced BP to sell assets at discounted prices, Magellan acquired $289 million in crude pipelines and storage capacity at just nine to 10 times EBITDA. This has generated a 10%-11% internal rate of return, and management remains disciplined in its growth strategy, seeking acquisitions and projects that will pay for themselves in just three to 10 years (10%-33% rate of return). With the recent announcement of the $1 billion Saddlehorn pipeline, Magellan has about $2.5 billion in projects in the works that should all come online by the end of 2016. On top of that, it has another $500 million in potential projects in managements sights. Thanks to management's impressive and disciplined growth strategy, Magellan sports some of the industry's best operating margins and a rock-solid distribution coverage ratio that provides a safe payout and is expected to grow at 20% in 2014 and 15% in 2015. Magellan Midstream Partners is truly one of the best midstream MLPs in the United States and a great long-term choice for any income investor looking to profit from America's historic energy boom. Its low cost of capital, low debt leverage, and one of the best management teams in the industry is likely to result in decades of strong, sustainable distribution growth that will maximize the probability of beating the market in the long term while generating generous income.